Boston tours during winter months let you see the city in a new way - with no leaves to block the view! Although fewer Boston tours take place during winter months compared with other times of the year, the good news is that you’ll still have plenty of tour choices for sightseeing, cruising around Boston Harbor, exploring historic sites, and visiting top day trip destinations. 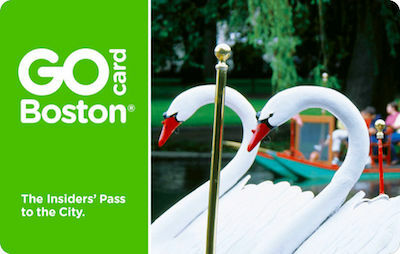 Best of all, Boston winter tours for the chilly months - November, December, January, February, and even March (yes, March can qualify as “winter” here!) 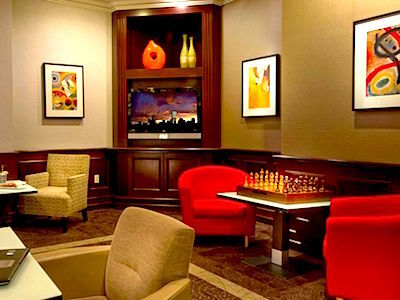 - show you our top sights and attractions while keeping you warm and comfortable. 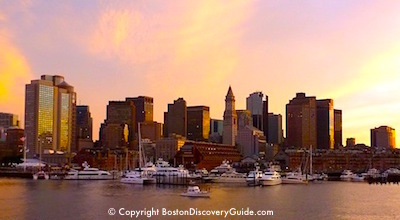 Enjoy a gourmet meal and spectacular skyline views on a luxury Boston Harbor dinner cruise ship. 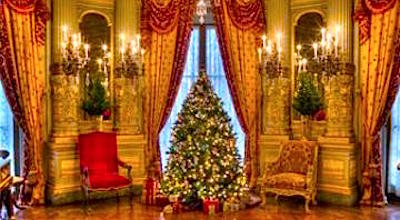 Experience the gilded age in Newport amid lavish Christmas decorations. 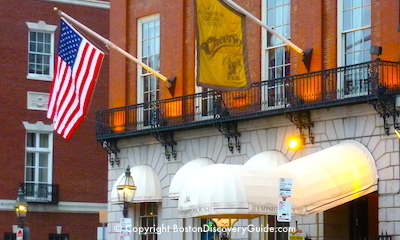 Visit places you've see before...in iconic movies filmed in Boston. And that's just the beginning. And if you're looking for a great rainy day activity, most of these fun tours will give you a fun view of the city while keeping you dry. Boston sparkles during the winter with holidays, decorations, and good cheer. These exciting walking tours, trolley and bus tours, and indoor destinations will show you the best of the city during this special time of the year! Less than an hour from Boston, the Newport mansions embody 19th century Gilded Age opulence. Come see how elaborate holiday decorations transform these grand homes into dazzling extravaganzas. Your comfortable tour coach will pick you up in Boston and whisk you to Newport where you'll visit The Breakers, a 70-room waterfront mansion, and Marble House, inspired by Pet it Trianon at Versailles. Note: These special Christmas tours are offered only during November and December. What's the best indoor activity during bad weather? Shopping! Wrentham Village Outlets, located 22 miles south of Boston offers deep discounts on high-end and luxury designer brands, with prices typically 25%-50% less than retail - and even lower if you happen to hit a sale! 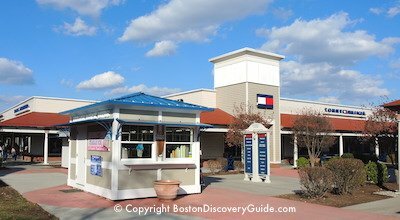 The Outlets Tours basically just provides transportation to and from Boston, since you can tour the stores on your own - so sit back, relax, and enjoy this carefree way to get to the best discount shopping in the Boston area. Although most local cruises operate only during warmer seasons, Boston’s two biggest luxury cruise ships continue offering Harbor tours throughout the winter. Thanks to their large size and excellent climate control systems, the Odyssey and Spirit of Boston provide a comfortable cruise as they show you spectacular city skyline views and the fascinating Harbor Islands. Enjoy a tasty meal prepared by an on-board chef, order your favorite beverage from the attentive wait staff, and try out the dance floor! Outside? Snow, sleet, or freezing rain may be driving down, and an icy wind may be blowing - but you won't care because you'll be inside the warm, welcoming ship as you'll be watching through the windows as the wintry scenes unfold. Less-than-perfect weather won’t slow you down on this fascinating Boston TV and Movie Locations Tour. 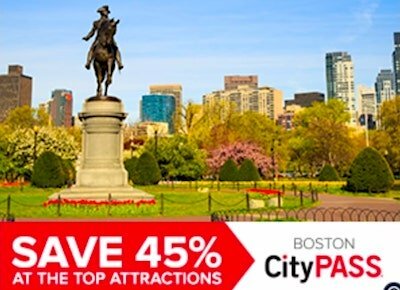 You'll tour in comfort in a warm luxury bus while seeing real Boston locations used in iconic television shows and movies such as Mystic River, The Departed, Cheers, The Town. Best of all, your guide will show you clips of the actual movies, and share behind-the-scene information about how these local sites get transformed into what you see on the wide screen. Your tour makes several stops - so keep your camera ready! 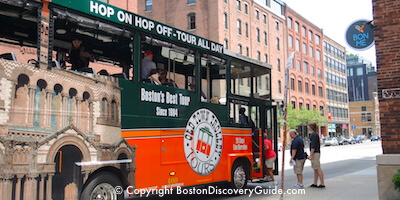 Consistently rated as one of the very best Boston tours. Tour MFA's new Art of the Americas wing ... get a close look at their Asian and European art collections... see the most exciting contemporary pieces. 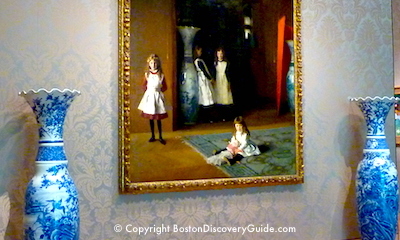 These are just a few of the fascinating museum tours offered free (with the price of admission) by Boston's world-famous Museum of Fine Arts, a perfect place to spend the day when the weather is less than stellar. MFA even offers these tours in French, ASL, Spanish, Russian, and other languages beyond English. 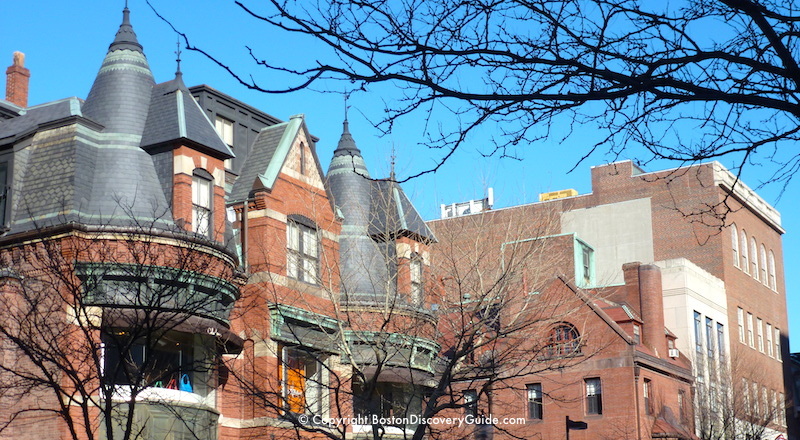 On this fascinating walking tour of Boston's historic North End, your guide takes you to the oldest parts of the city and brings to life the drama of the late 18th century, when this neighborhood played a crucial role in the beginning of the American Revolution. 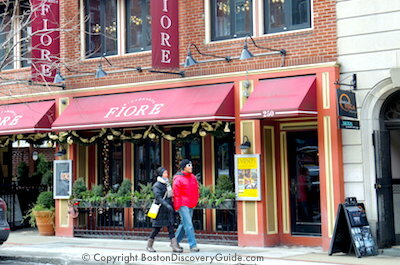 Of course your guide will take you to see all the famous places: Paul Revere's house, Old North Church, the waterfront where pirates and bootleggers once roamed - but you'll also experience the North End's lively Italian culture and savor the delicious aromas of Italian specialties drifting from the restaurants. Be sure to stay for lunch! 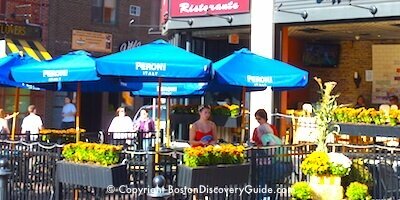 If you're doing one of these Boston walking tours when the weather is cold, dress in layers so that you can remove a layer or two if the sun shines brightly (you may be surprised by how warm you'll get as you're walking around) - and add layers if the wind starts blowing strongly. Warm gloves, thick-soled shoes, a scarf, and a hat will also add to your comfort. 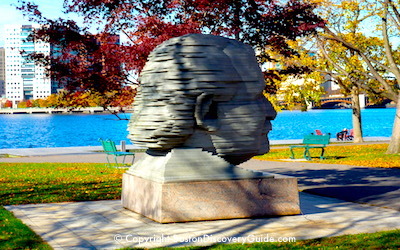 Boston's Esplanade may be best known for the Hatch Shell where the Boston Pops give their famous July 4th concert. But visit during fall or winter, and you can enjoy sweeping river views, examine the many statues, and walk or jog along the winding paths along the river. To get there from Boston's Public Garden, simply walk along Arlington Street to Charles Street and lightly to the left, pick up Garnier Way - almost an extension of Arlington Street. You'll almost immediately see the curving Fiedler Footbridge arching across Storrow Drive. Walk up the ramp - and take a moment to savor the expansive views. To you're right, you'll see the Hatch shell, site of the famous Boston Pops July 4th concert. To your left is a wonderful playground for kids. Nearby, you'll find the striking 8-foot head of famed Pops Conductor Arthur Fiedler carved from 83 layers of sand-blasted aluminum. Stroll in the other direction, and get a close-up look at the beautiful inlaid wood lining the Hatch Shell. Pose for a photo next to the cannon used in the 1812 Overture at the end of the July 4th Boston Pops concert each summer. On sunny days, relax in one of the benches along the river and watch the ducks bob for fish in the water. 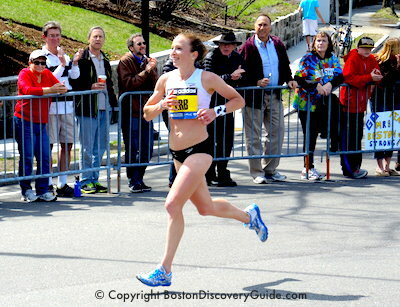 Most of all, enjoy having found one of Boston's almost-hidden treasures! Fenway Park Tour - In the winter?!? Yes, the famous ball park looks magical with snow on the ground, and you'll love the close-up views! Winter Break in Boston - School's out - best things to do in Boston!